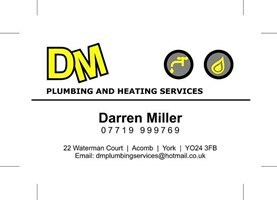 DM Plumbing & Heating Services Ltd - Plumber based in York, North Yorkshire. We pride ourselves in offering our customers a professional service and we guarantee all our workmanship for 12 months. Quality is of the highest standard and we cover all aspects of general plumbing from a leaking tap or burst pipe to a complete bathroom or kitchen installation including tiling and plastering at competitive rates. We offer a free no obligation quote and no hidden call out charges for emergency repairs.